Statue loving Governor, Rochas Okorocha appoints sister as commissioner for Happiness and couples fulfillment!.. 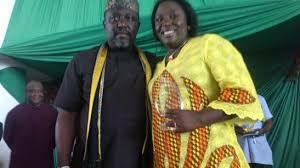 No this isn't a joke!.Imo Governor Rochas Okorocha has indeed appointed his biological sister as a commissioner for Happiness in the state! He reportedly made 28 new commissioners and 27 Transition Committee Chairmen for the 27 local government councils in the state including his sister Mrs. Ogechi Ololo (nee Okorocha). who is now the state’s Commissioner for Happiness and Couples’ Fulfillment. Ololo, had previously served in various capacities since her brother became governor in 2011. Imo People Eku Happiness and Fulfillment ohh..